After an agonizing wait, we now know Verizon's plans for the Tab, right from the source itself. The tablet will be available three weeks from now, on the 11th of November, and the full retail price is to be $599.99 - although VZW has not disclosed any on-contract price. An optional $20/mo 1 GB tariff is alluded to but it is unclear whether or not this will bring with it a discount to the Tab's sticker price. If the MiFi iPad plan is any indication, this $20 monthly option may be a rolling 30 day contract without any device subsidy, but that is wait-and-see right now. Verizon will be preloading the usual inexplicable bloatware suite including V CAST Music, BLOCKBUSTER On Demand and several other unwanted items. On the positive side, the Tab will also be bundled with Slacker Radio, Kindle for Android, and Gameloft's cutesy Let's Golf game. No mention is made of Bing inclusion or otherwise, and the search widget is excluded from the provided screenshots. Full press release reproduced beneath. 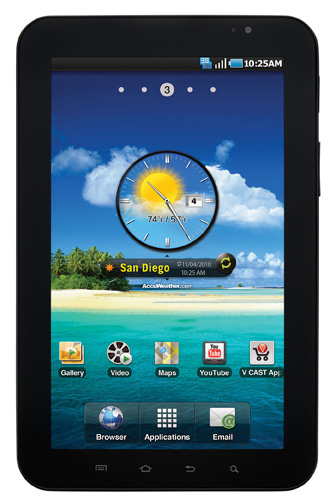 BASKING RIDGE, N.J., and DALLAS – Verizon Wireless and Samsung Telecommunications America (Samsung Mobile) today announced the highly anticipated Samsung Galaxy Tab™ will be available Nov. 11 for $599.99. 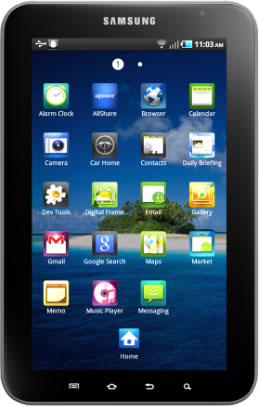 Running on Android™ 2.2, the Samsung Galaxy Tab features a brilliant 7-inch touch screen; robust HTML Web browsing experience with full support for Adobe® Flash® 10.1 for video and mobile gaming; and a 1GHz Cortex A8 Hummingbird Application processor.